Pip: Brendan, you know that thing when your parents ask you to look after their plants or cats or whatever while they go on holiday and suddenly the crushing weight of responsibility and not abusing the access you suddenly have to the wine cupboard rests heavy on your shoulders? Brendan: I have heard of this feeling. Pip: Is that what’s happened with Shut Up and Sit Down with Paul in the US and Quinns off in Bali? And now we have to water the board games and take the cards to the vet? Brendan: What? What are you doing with that watering can? Get away from the board games! Oh God, what have you done? Everything is all… mushy. Pip: No no, it’s fine, there are two left! Yardmaster and Paradise Fallen. We can still do a review of these and Paul won’t do his disappointed face at us. Brendan: I hate Paul’s disappointed face. It looks like Gary Oldman. Still, it’s kind of wet and cold in here now. Brendan: Okay. 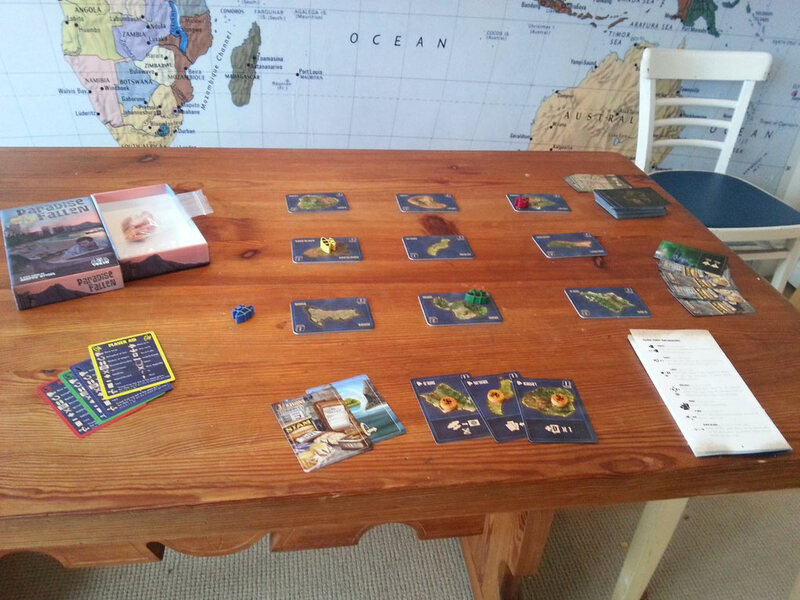 Paradise Fallen is a 2-4 player card game of canoes and Pacific islands. 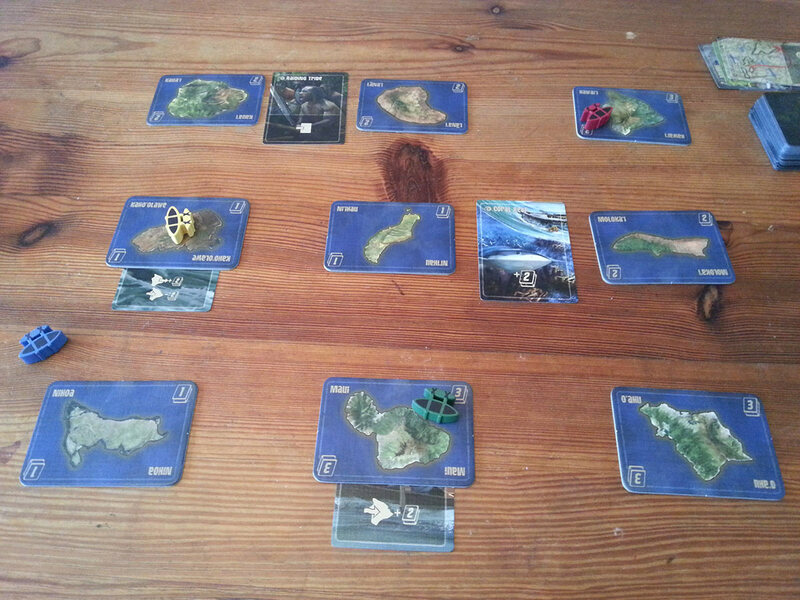 The nine islands are spread out on the table in a grid and the first player to visit enough of these islands wins. 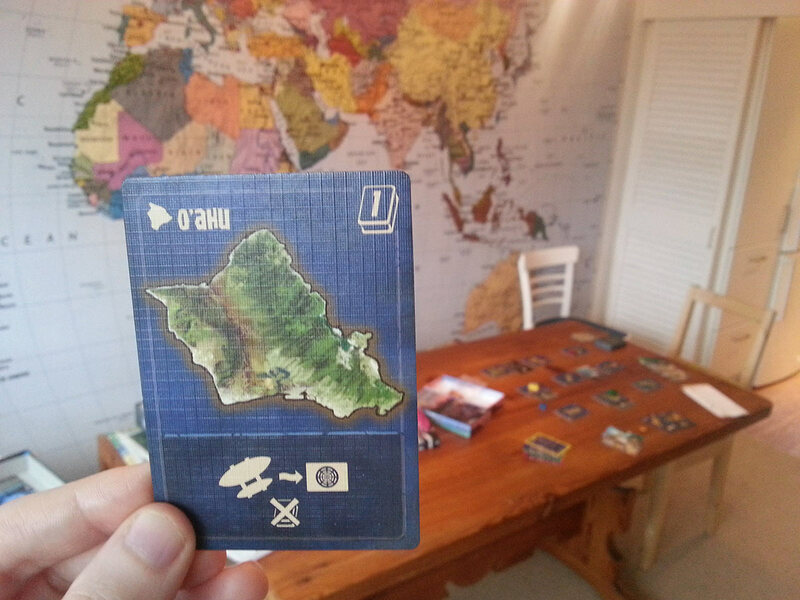 With four players, you’ll need to explore six of the tropical landmasses. With two players, you’ll need to hit a whopping eight islands. 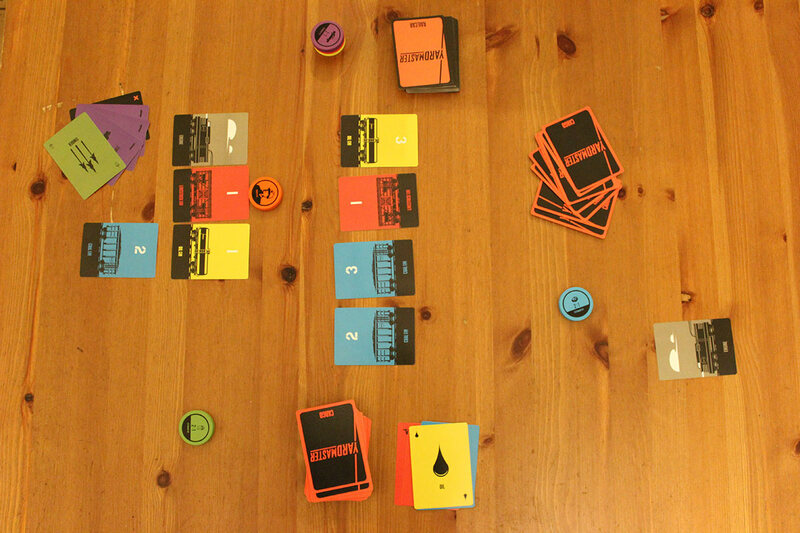 The game has a post-apocalyptic theme (the box depicts ruined cities and some Mark Wahlberg-looking dude scrounging for supplies on a beach) but when you start playing, you will quickly notice the game has pretty much nothing to do with post-catastrophe survival, apart from the use of “ration cards” and some weird looking mist. Ration cards are important. To go anywhere in the wasteland (wastesea?) you have to have enough ration cards to either pass over an island or end your movement on it. 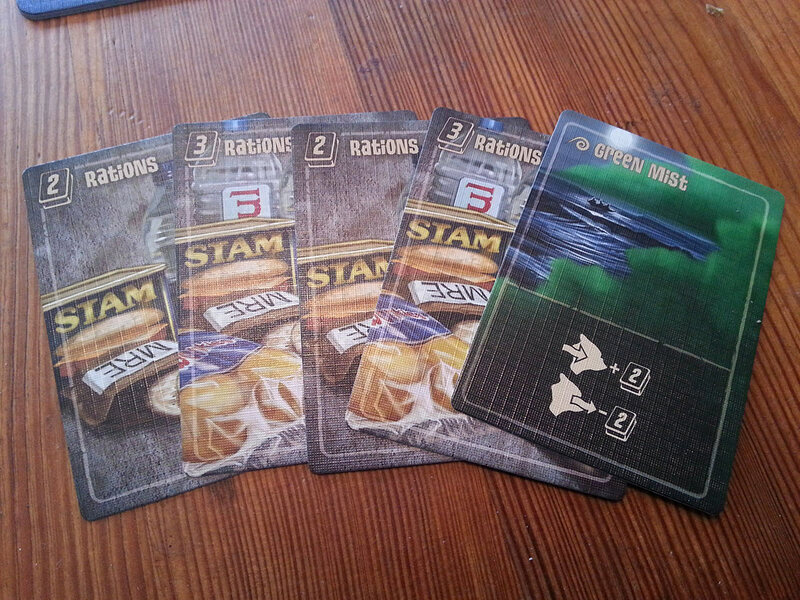 Each player has a replenishing hand of five cards. Some of these will be the rations you need but others will be skills — ‘aptitude cards’ which you can use to do tricksy things, like teleport from one end of the board to the other, or manoeuvre your canoe diagonally (something that is not normally allowed). 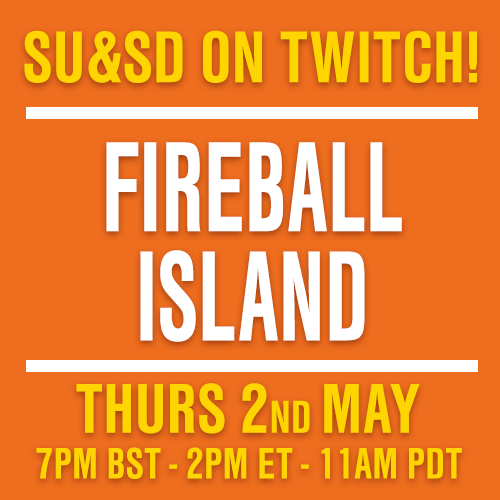 Other cards will be island cards, which you play while stopped on an island to announce that you have explored it. Then there are the aberration cards. This is where the meaty bit of the game is. Aberrations are nasty things. They can be placed on any island (or sometimes between islands) and are designed to screw over other players. The coral reef, for instance, means players have to spend more rations getting across some water. A raiding tribe will cost any passing player a card from their hand. Green mist makes it cheaper in rations to pass by an island without stopping, but more expensive to actually get out of your canoe and explore. By the end of the game, there will likely be aberrations all over the place and it’s up to the players to navigate these and keep exploring. 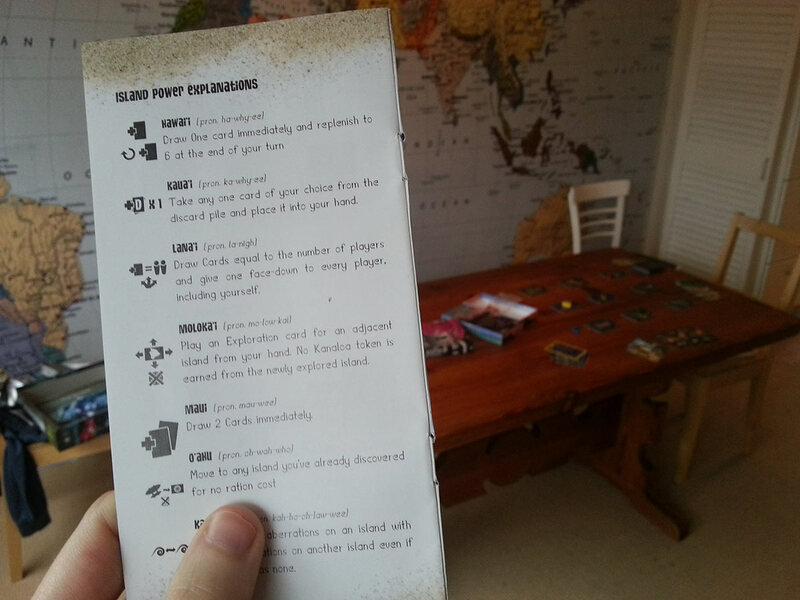 Any time someone scores an island card by exploring, they get a one-use power, similar to the aptitude cards. But you might not want to use all these — the tiebreaker for this game sees the player with the most “unused powers” win. On the face of it, it is a straightforward game. It comes in a small box and it has a very thin rules book. I love a thin rules book. Pip, how often would you say we had to check the very thin rules book? Pip: Approximately one billion times. Pip: So frustrating. It’s entirely because the game uses symbols instead of text on the cards. Usually that stuff works fine but the symbols in Paradise Lost make absolutely no intuitive sense. That means you keep forgetting what a card actually does and need to flip back and forth through the booklet. There was one where I think the real explanation was that you could return to an island you’d already visited without needing to spend any rations. We tried to understand it without checking the rulebook and the best we could come up with was “if you pilot a zeppelin into a dartboard you forfeit the window seat on a plane.” That, in my [very thin] book, is a problem. Brendan: It isn’t made much easier by the ‘player aid’ card either, which essentially breaks down all the symbols into single elements, like some kind of tiny, mad dictionary. Pip: Or the fact that the way the aberrations behave is counter-intuitive sometimes. Like how a whirlpool draws you to an island rather than, like, the middle of the whirlpool. There’s also a card which lets you swap aberrations but some aberrations are tied to islands and some sit between them. The rule book didn’t seem to have any guidance on whether you could swap those. Overall, It feels a lot like a set of systems the designers liked and then tried to dress up with Pacific ocean clothes. Brendan: The thing is, I can see the game underneath all this, just squirming to get out of its cage, like a horrible mutant squid trapped under a rock. I think if four players came to the table knowing instinctively what special thing each card did, they would have a much better time. Because it feels satisfyingly competitive in that simple, passive-aggressive way. But to get to that stage I think you need to play it at least three or four times over. Sadly, I think a lot of people will want to move onto something with a bit more bite. That’s definitely my personal preference. I think Paradise Fallen is smart, I just don’t think it is great fun. Pip: Mm, I think if it just put plain text on the cards it would be better. A lot of what slows it down is the constant checking and forgetting what things do. If it were able to flow better it would be shorter and therefore snappier and more enjoyable. Brendan: Okay. Let’s try a different game instead. Yardmaster! My, it has a pretty box. Pip: It’s incredibly stylish isn’t it? You also get to build a train! But just look at the box – all orange and minimalism and strong silhouettes – like if a game about trains and a Penguin book cover had a baby. 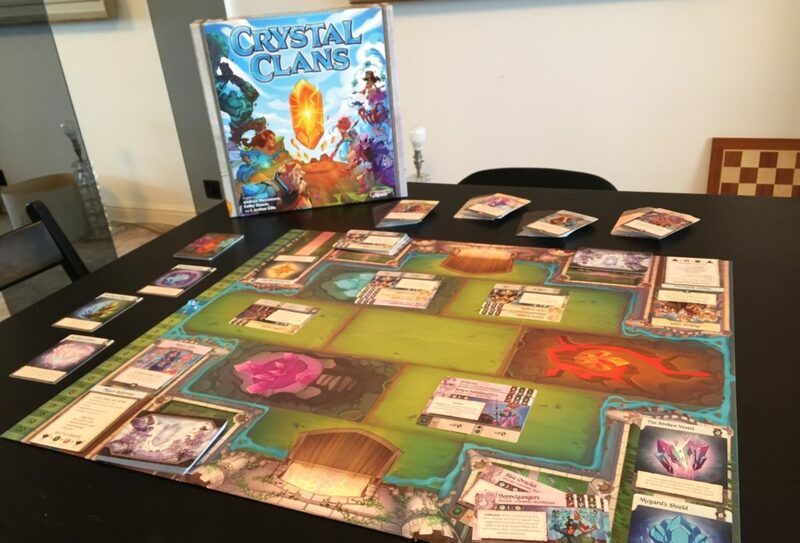 It’s definitely a coffee table board game, if that’s even a thing. Brendan: I think ‘coffee table board game’ is a great genre to summarily invent on a visit to the pub because you have drenched all your friend’s earthly possessions in water. Pip: Coffee grounds are actually good for plants, I wonder if the same is true of board games? Brendan: NO PIP STOP PLEASE JUST TELL ME THE RULES OF YARDMASTER. Pip: You used to be fun. Anyway, let’s talk trains. 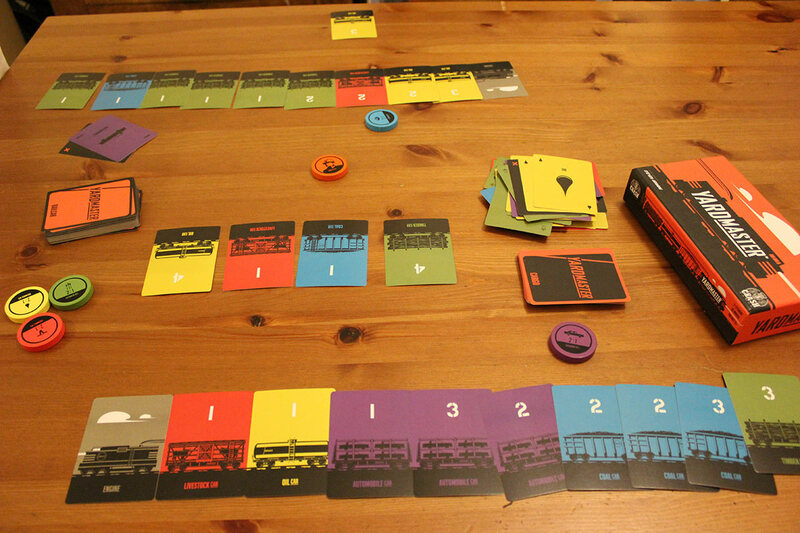 What you’re trying to do in Yardmaster is build a train. To win the game your train needs to be worth a certain number of points which you get by chaining railcar cards behind the engine. Each of those is worth a certain amount of victory points and those are handily written on each railcar card. But it’s not just a matter of whacking a bunch of different types of car in a line behind you. What do you think this is? Some two-bit follow the leader operation? No, Brendan. No it is not. Pip: I can’t believe you even suggested that. Each railcar needs to either match the colour of the one in front or match the value. You can prepare stacks of railcars in advance by keeping them in your ‘sorting yard’ (just a blank bit of the table not connected to your train) and then add them whenever possible to make the points count. You get hold of these railcars by paying for them using cargo cards. You’ll start off with five of those and can pick more up using actions on your turn. 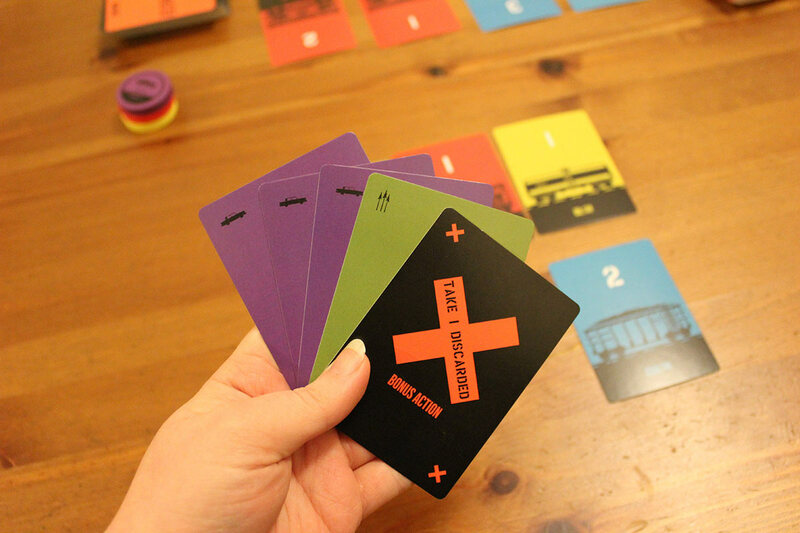 Actions can also be used to buy railcars (the value of the railcar is also the amount of cards of that colour it costs) and to swap exchange rate tokens. The exchange rate tokens are a little helping hand for when you have a lot of one cargo type and there are no railcars you want of that type for sale.They let you use two cards of the colour exchange token you have to be worth one of any other colour. What am I forgetting? Oh! There’s a stationmaster token we passed between us, first having it face down, then face up, then to the other person. When it was face up you got to do three actions instead of two. Oh, and mixed in with the cargo cards are a bunch of bonus cards which each do special things – let you rummage for things in discard piles – that sort of thing. Brendan: In summary: TRAINS. Do we like trains here at SUSD? Yes, we do. Quinns spends his Sundays spotting them and I am often caught on one without a ticket. 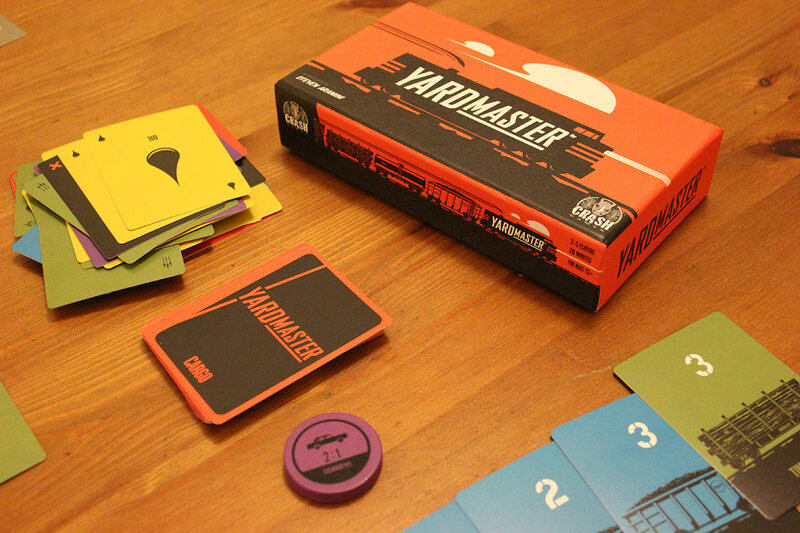 Do we like Yardmaster though? That is another question. Pip, do you like Yardmaster? Brendan: AHA. Two can play the interruption game! I think Yardmaster is OK. It is a quiet, peaceable game of sorting and humming. It did not make me leap out of my cushioned seat with enthusiasm but it was very pleasant. The key to it, I found, was using the exchange rate token whenever you could and swapping it around, to use up as many of your excess cargo as possible. I also liked the way you could swap this token for one somebody was already holding, possibly messing up their entire economic plan in the process. Pip: I didn’t use the tokens so much. My strategy was more reliant on putting a lot of lower value railcars in my sorting yard and then looking out for cars which I could use to chain them on to my main train. The finish was actually pretty close so I’d say both are viable approaches. Brendan: Definitely. I did also like the look of your train over mine. It was packed with beautiful green lumber, whereas mine was a mess of colours and cargo. Mine looked like a train piled with goods that “fell off the back of a lorry”. Pip: I was a lumberjack and I was okay. Yardmaster is also definitely okay. We played it, we understood what all the bits did. We hadn’t forgotten what all the bits did when we came back from having a tactical pie dinner break. It didn’t set our world alight (probably just as well given the lumber situation) but it was a decent accompaniment to our pints. Brendan: It definitely was the opposite of Paradise Fallen in terms of ease of play. No bonus card had more than about three words on it and all were understandable. 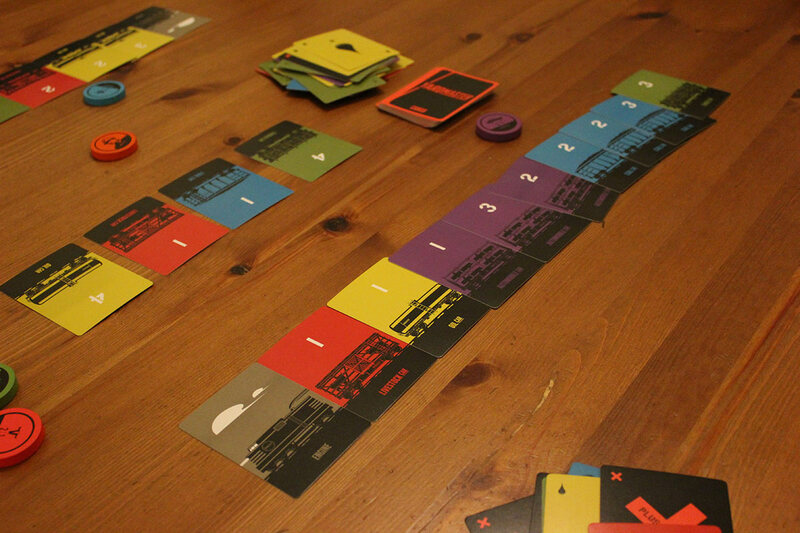 Pip: Of the two Yardmaster is definitely the strongest. And very pretty. Brendan: Still… I am not sure if it can go on SUSD’s Big Whiteboard of Recommendations. We only have two games left but for everybody else? They have another option. 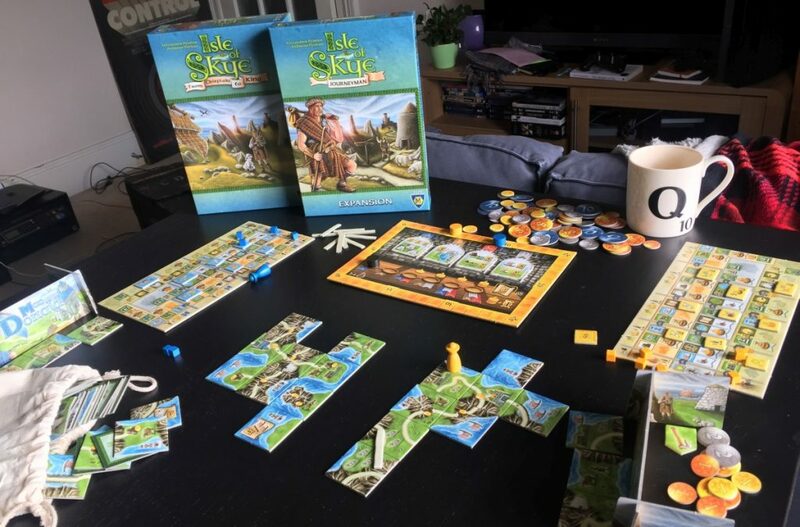 Brendan: When you mentioned ‘coffee table board games’ that got me thinking of another card game that we have reviewed before. Jaipur. It is similarly quiet and easygoing but has the added bonus of camels. I don’t even mean this as a joke. The camels are Yardmaster’s cargo and Paradise Fallen’s rations times a million. 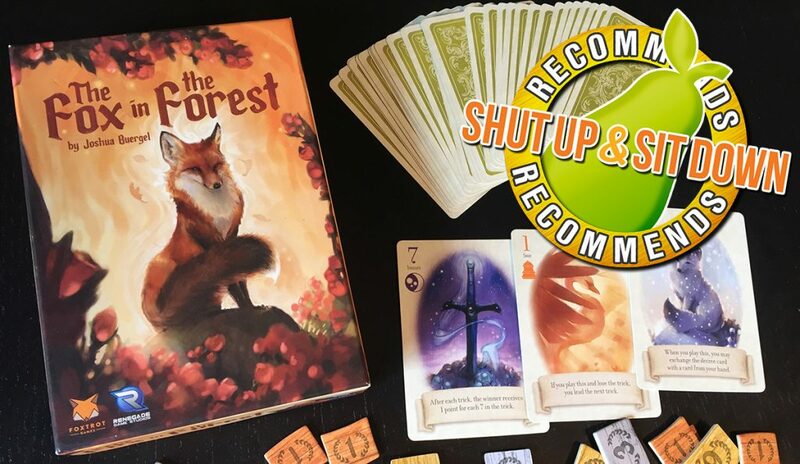 I’d say to anyone looking to get something good in a small box to definitely check out our review of Jaipur. Oh, here comes the waiter. Waiter: Would you like some water? Pip: Yes, thank you, these games look pretty wilted. Brendan: PIP NO oh all right.